Appearance - The beer poured a handsome copper color with a foamy slightly off-white head. Smell - The aroma initially strikes me as a doppelbock, but I then notice the hops. It just does not fit in my mind. Taste - The caramel is noticeable at the front but the hops and a mild citrus sensation flows over the tongue as the beer moves toward the back. There is not the odd metallic taste that some doppelbocks leave. Instead, the citrus lingers in the aftertaste. Mouthfeel - Tett just seems a hair too thick to be a doppelbock. It almost reminds me of a DIPA blended with a doppelbock. Overall - I love Capital and I love doppelbocks. Capital was probably wise to retire this one. Their other doppelbocks are very good. Pours out brownish-amber with a stable 3mm foam lid, minimal lacing qualities. Bizarro lemon-peel hopped aroma for a doppelbock, yet it works. What I smell is sort of like a cross between caramel apple aroma and lemon crumble dessert bars with a splash of herbal tea on the side. Flavor is an initial hit of lemon rind that melts away into the sweet toffee and bread medley of the signature Capital doppelbock base, although the nutty tones are conspicuously absent, having been replaced by the grassy / herbal / tea with a lemon wedge of the Tettnang hopping. How hopped is it? I'd personally call it a pale ale level of hopping intensity, but YMMV. Once again, ABV is completely hidden in both the nose and the taste. Medium-thick body texture, smooth and creamy, medium light carbonation levels. In summary, I get exactly what is promised by the label: A well-made Doppelbock base with the addition of a healthy dose of Tettnang hops' zestiness. Certainly the result is FAR from traditional, but that's kind of the point here. As Devo once said, "It's time for new traditions." Single from Timer's. Served in a tulip glass. Reddish copper body topped with light tan foam, tiny pinhole flecks of lace spatter the sides of the glass. Dominant tea aroma, lightly woody and grassy from the noble hops. Some deep malt complexity also present. Sweet bready malt, dry bitterness, slight lemony hop fruitiness. Smooth and clean, flavorful, hides the abv well. Plan to revisit this one soon. Appearance: Very light for a dopplebock. Very much an amber color. Very nice finger thick fine head. Smell: Malty with some sweetness. A little bit of alcohol comes through The nose is a little weak but solid. Taste: Very 'amber' tasting. Roasted malts with a dry finish. Very little floral notes. Lots of grains and some yeast notes. Not nearly as hearty as a traditional dopplebock but its pretty obvious that's what they were going for. If I didn't know this was a dopplebock, I would think the finish was a low proof weizen which speaks to how well they hid the alcohol and the sublteness they were going for in the flavor. Mouthfeel: Very nice carbonation for the style. Much more so than a darker german version. The carbonation allows some of the darker notes to come through. Overall: I really liked this beer. It's not an amazing beer, but for an 8% it's incredibly drinkable. It's obvious that they weren't going for a stick to your ribs beer. Still, would have liked a little bit more punch in the flavor and in the nose particularly. Solid Beer. Darkish amber body topped with a creamy beige head. The head dissipates fairly quickly, though lacing persists. The aroma is pretty classic but a little weak. Malty and caramely with some dark fruit as well. The driest dopplebock I've had from Capital. The flavor is OK but like the aroma is too watery. A little more bitter than I enjoy, though I'm sure some more sweetness would have countered that. The mouthfeel is again just a little light. Otherwise the carbonation is very pleasant. Not my favorite from one of my favorite sources for dopplebocks. Bottle purchased. from Friar Tuck's in Savoy, IL. Poured into a Celebrator doppelbock glass. Pours a frothy, pillowy head of 4cm, dirty white in color. Fades leaving some small clumps of lacing, but fairly vigorous carbonation seems to support a small head infinitely long. Body is a dark brown-orange-copper creation with orange highlights under a lamp. Transparent. Scent is dominated by spicy, herbal Germanic hops, mixed with deep, sweet maltiness like, as one reviewer noted, fig cookies. I also get a slight twinge of ethanol as this warms. Opens with very nice noble, Tettnang hop flavors. It's gentle, but very dominant. Gradually this is balanced by a sweet maltiness that's not too heavy, creating a sort of doppelbock-tea flavor with a bit of astringency. Fades out with continued malt presence, picking up some definite caramel characters. Aftertaste is of faint noble hop spiciness and malt sweetness. Body is medium to medium-heavy with a modest carbonation that creates a smooth and silky feeling on the palate. Finish is very dry. This is a very good, somewhat experimental, doppelbock. While not the avatar of the style (or should this hopped doppel be a style of its own? ), I think this could be a quite exceptional summer variety of the style if they would drop the ABV a bit. Still, one to keep an eye out for when released. Bottle from Riley's. 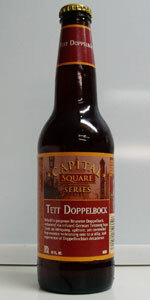 "The art of the dopplebock" belongs to Capital. This is an example of this charm. Dark brown with little head, I placed it in a De Koninck glass. Malty, yeasty, cocoa aroma. A tad above average mouthfeel yields a rich and complex malting. Very satisfying, very drinkable. Poured a nice clean deep clear dark orange with a thin yet persistent off white head. The smell is all malt, huge waves of sweet brown sugar and molasses dominate the nose. The flavor is surprisingly subtle and refined after the giant aroma, light bready malts with notes of toffee and caramel, finishes with a light spicy and earthy hop flavor without much bitterness, very much a malt centric beer as it should be, but the tettnang adds some interesting levels of spice to the finish. The mouthfeel is thick and full with good levels of carbonation. This is an interesting doppel, nice and complex. Capital really seems to excel at this style of beer. Had this beer at Capital's Biergarten as a prototype a year or two ago and hated it. Giving it another whirl with an open mind. Pours amber-orange, lightly chill-hazed with a tight ecru foam which retains and laces moderately well. Aroma of crusty bread, toffee, Fig Newtons, Marsala wine, and prunes. A fairly nuanced malt attack through the mouth. Darts of toffee and figs skirt across a battlefield strewn with bread and molasses. Tracers of plum (and prune) and anise cross the crusted bread sky. Rivulets of ruby red, brandy-fortified wine trickle down. A light, almost transparent rosy, florality adds a late levity to it all. Medium-full bodied with a light but steady march of carbonation. This is the type of thing that Capital does best, and while it's not their ultimate doppelbock incantation, it's enjoyable, and they should be lauded for fooling around within their area of strength. It gives me hope for a return to form. And for what it's worth, it's much better than my initial impression back when. Pours a deep amber/brown with a thin off-white head. Slightly hazy body with a decent amount of lacing. Aroma is extremely malt forward; toffee, caramel, brown bread, roasty. Some grassy/earthy notes in there as well. Flavor follows the nose; very malty, bready and sweet. Pretty on par for a doppelbock. Creamy/chewy body with moderate carbonation. Finishes rather sweet. Very good doppelbock. Appearance - Amber brown. Slightly cloudy. Medium creamy off white head. Fairly persistent. Smell - Not strong. Caramel hops is most prominent aroma. A little bread, a little spicy hops. Taste - Somewhat sharp medium roasted malt flavor opens. Sweet caramel with a slight burnt flavor. Finishes with a moderate dose of piney hops. Not exactly what I'd expect from a doppelock. Overall - Something a little different from Capital, but not one of my favorites. Colo is copper with some very small suspended sediment and a few bubbles rising to the top. The head is a nice lightbeige that leaves a one finger headof foam, but after a few sips, recedes to nothing. Soft caramel dripped on top of toasted, homemade white bread, with maybe a little grass make up the brunt of this beer's aroma. Sweet toasted malts, caramel, and some very soft plums. The palate is just a little syrupy, but goes down well carbonated. The 8% abv. is hardly noticed in the taste or palate, except when it warms up a bit. Very easy and enjoyable to drink for any doppelbock fan. A - Slightly hazy, amber, light copper with a thin head a spotty lacing. S - Light sweet toffee, caramel, toasted bread with herbal, spicy hops. T - Sweet caramel and toffee with some bready notes and herbal hops. Lingering piney hop notes in the finish that sticks on the tongue. M - Medium body with light carbonation and a lingering hop dryness.